Deal or no deal the slot game is a 20 line, 5 reel video slot game exclusive to Jackpotjoy. On first glance Deal or No Deal Slots is the same as a regular slots game just with better graphics and sound effects, but it's the bonus features that make this special. 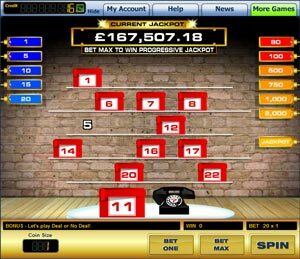 The makers have introduced a few features to keep this in theme with the TV show for example every now and again the banker will inform you that your next spin is a guaranteed win and will offer you a set prize to either Deal or No Deal against. This is the main feature of the game and it is activated by spinning in 3x deal or no deal symbols. This feature board plays very similarly to the TV show. 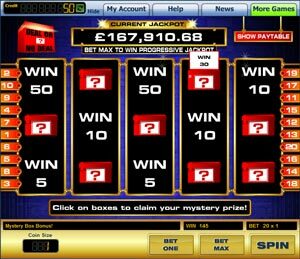 You start off by picking your own box, then you proceed to eliminate the boxes on the board (which contain varying amounts between £1-£2,500 and the jackpot), revealing their containing amounts in the process and at the end of each round the banker will make you an offer based on the value of the remaining boxes for which you can deal or no deal until you either accept or are left with the box you originally choose to reveal your winnings. In keeping with the TV show if you choose to deal, the amount in your own box will be revealed to see if you made the best choice. This activates a board where you can keep picking boxes which contain hidden amounts until you pick a box which contains a bankrupt sign. You are awarded however much you were able to reveal up to that point.